A smidgen over $14K and made in Thailand, can this thoroughly modern reinvention really live up to its iconic legacy? Sometimes, working on a motorcycle magazine means early starts, late finishes and becoming familiar with syntax rules of Finnish, Turkish or whatever language the latest hotshot racer speaks. 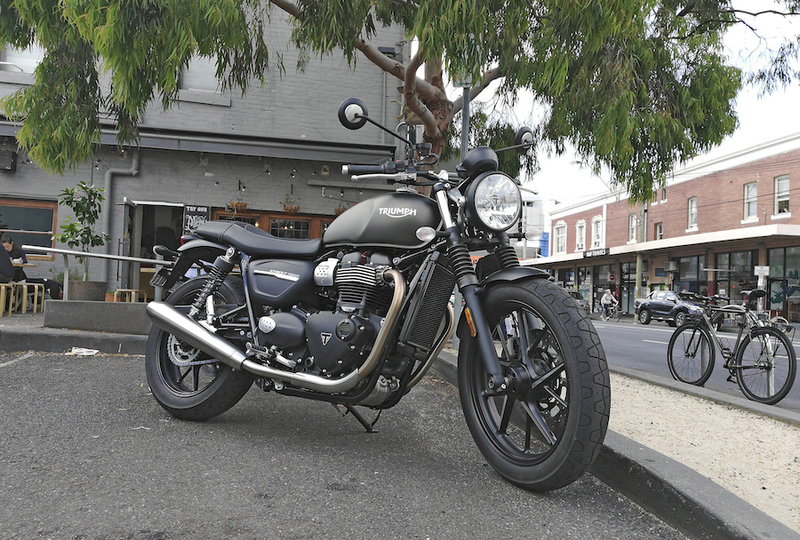 And sometimes, it means throwing a leg over the occasional motorcycle and in this case, Triumph’s new Street Twin. But why me? I do not appear to be much of a fit with the people in Triumph’s PR images. Yep, I own a beard, but not a full one. I’m far from my twenties, and I do not stop for a demi-soy cappuccino any chance I get. I have not owned an open face helmet since… well, never. Maybe I fit another target market. I never got the chance to buy a Triumph when I wanted to, because of the combined effects of romance, marriage, mortgages, kids, education, orthodontics, some kind of rash (that I should not really talk about) and a career spent accumulating laptops and losing hair. Could it be that when they were idiot-proofing the Street Twin, I was just the idiot Triumph’s engineers and marketeers had in mind? So it was that I find myself with another motorcycle in the garage. A Pommy parallel-twin, grey as a Manchester sky in August – or, in Triumph-speak, Matt Ironstone, two words that sound like they should be followed by the phrases ‘Private Investigator’ and ‘Coming Soon to Netflix’. What am I going to tell you that Alan Cathcart did not already in AMCN Vol 68 No 13? Right now, not a lot, cos I’ve only just picked it up. But I’m going to learn more with a long-term test period than Al could have on his 225km ride along the shores of the Atlantic Ocean. I can, right now, agree with some of those things Sir Al mentioned. Like, it doesn’t vibrate, except, it does. You can feel through the grips and ’pegs that there is something going on below in the engine room. It’s not an electric bike; it’s a parallel twin, so you can feel it running. But that’s the thing. The mirrors are crystal-clear and stay that way all the way up until… well, I can’t say, because it does not have a separate tacho. And there are no tingling sensations through the tank. You could stand an open bottle of Bombay Sapphire on the tank, engine running, without any concerns. The first impression of the Twin’s performance is about what you would expect from brand names like KYB, Pirelli Phantoms and Brembos. Five speeds seem plenty; so does the single disc. Putting them together would be the hard part but early impressions are that there are no mismatched combinations in play here. As for the rest, I hope to get to that. But first impressions are, this is a stylish handsome beast, much like I wish I still was. What lies beneath the flawless exterior I will do my best to discover. The top of the single clock bears the word Bonneville. And in form, it looks just like a Bonnie. But is it, really? Is this really the 21st century, made-in-Thailand version of what was the object of teenage lust back in the days when Charlie’s Angels were, well, the objects of teenage lust? That’s what we’re here to find out. The first impressions are, yes it is. But that’s exactly what I want to find out. Stay tuned.